So you might be asking yourself, are pool pavers a specific line of pavers or can any paver be a pool paver? We would say, that is an excellent question. While any paver can essentially be used for pool pavers, some are more suitable – especially if you have a salt water pool. Pavers are made from three basic materials: concrete, brick and stone. 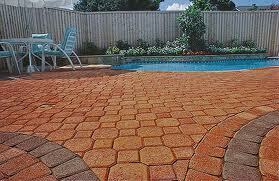 Pavers are an excellent material to use in areas that see a lot of water – primarily pool areas. Each of the three primary elements of the material are entirely sustainable and are able to withstand the gradual wear and effects of water. However, if you have a pool that contains salt water, special types of pavers are recommended because salt can have a negative impact on materials if they are not suited for them. Pavers are known for being able to withstand a high amount of wear and tear, in addition to their durability, they are naturally slip resistant. The texture of each paver is slightly abrasive which provides an excellent surface to walk upon – even when wet. When you look at a beautiful paver pool deck, the last thing that most likely enters your mind is that paver pool decks are affordable. Because pavers are held in place with a special type of sand, they simply will not crack because they are allowed to shift with movement or pressure. 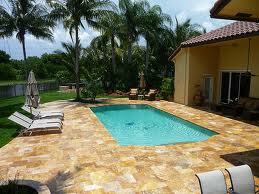 Essentially, paver pool decks don’t cost that much more than traditionally concrete. But because the pavers won’t crack, they are drastically cheaper because chances are that you will never have to replace the pavers – ever. Consider the streets of Europe – many of those are paver streets and have been there for centuries. In addition to their durability and sustainability pavers come in more colors and textures than you could ever image. If you want your pavers to be more natural looking and blend in with your landscape there are plenty to choose from. The same applies if you want your pavers to pop and make a statement. 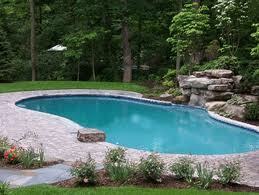 If you have any questions about pool pavers, we encourage you to give us a call. We would be more than happy to talk to you about your outdoor space and explore if pavers could be the right fit for you. This title may seem a bit strange to you – but have you really ever sat down and thought about all the ways that pavers can be used? In this blog we are going to run down a few of them – hopefully to inspire you to consider adding this beautiful material to your outdoor space. If you have read our blog before, then you are most likely acquainted with our fascination and love of paver driveways. Some of the key benefits of using pavers for driveways is the fact that if for some reason there is an oil spill or a bucket of paint bursts (which never happens) instead of having to jack hammer up the entire driveway, you can simply remove the paver, tap in a new one and you are good to go. And of course, with traditional concrete if you live in an area that sees vast temperature differences or seismic activity, you will be grateful for the ability to “tap” pavers into place. Pavers are held in place by a special type of sand that holds the pavers in place – similar to grout. The difference is that this “sand” allows the pavers to shift slightly is there is any type of movement. This ability to shift prevents any cracking of the pavers. Most of us have unfortunately experienced how slippery concrete can be when wet. This is one of the reasons that pavers are such a great choice for any area that is likely to become wet. 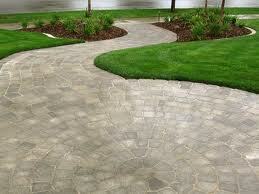 Because of the naturally abrasive texture of pavers, they provide grit and therefore are not slippery when wet. While they may not look like it, pavers are incredibly durable. They are able to take a lot of weight and thus are a great solution for high traffic commercial areas. Pretty much unlike any other material, pavers come in more colors shapes and sizes than you can possibly imagine. It doesn’t matter if your house is a ranch style, feels more contemporary, adobe or anything in between – rest assured there is a paver style, texture and color that is right for you.